Portugal’s former Prime Minister Antonio Guterres is poised to become the next UN secretary general, UN diplomats say. Mr Guterres, 66, was the “clear favourite”, Russia’s UN ambassador Vitaly Churkin announced on Wednesday. The process was “remarkably” uncontroversial, said Samantha Power, the US representative to the UN. “In the end, there was just a candidate whose experience, vision, and versatility across a range of areas proved compelling,” she said, adding that the process involved more scrutiny than ever before. An engineer by trade, Mr Guterres first entered into politics in 1976 in Portugal’s first democratic election after the “Carnation revolution” that ended five decades of dictatorship. As head of the UNHCR refugee agency from 2005 to 2015, Mr Guterres led the agency through some of the world’s worst refugee crises, including Syria, Afghanistan, Iraq. 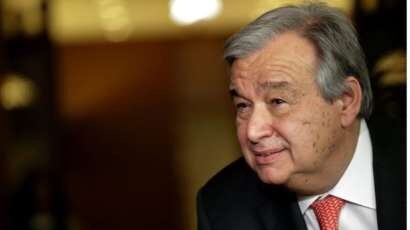 Former Portuguese President Anibal Cavaco Silva said earlier this year that Mr Guterres had “left a legacy” at the refugee agency “that means today he is a respected voice and all the world listens to him”, according to the AFP news agency. They were asked to select from a choice of ‘encourage’, ‘discourage’ or ‘no opinion’ for each candidate, with the former Portuguese prime minister receiving 13 ‘encourage’ votes and two ‘no opinion’ votes. His nomination came despite a concerted effort to appoint the UN’s first female secretary general. The Security Council – with five of its members wielding vetos – is the most powerful body in the UN. While not as powerful, the secretary general serves as the organisation’s top diplomat and chief “administrative officer”. It has been described as the most impossible job in the world, says the BBC’s diplomatic correspondent James Landale. The secretary general of the United Nations has to run an unwieldy bureaucracy and manage the competing demands of the world’s big powers, he adds.